Location : earth...and often island hopping...shaka! Despite his failure to heal the country's stark sectarian divides, Iraqi prime minister Nouri al-Maliki is nearly guaranteed a third term at the helm after the latest elections. The United States withdrew from Iraq in 2012 after nine years of a brutal occupation marked by the imprisonment of over 60,000 people, the death of hundreds of thousands, the torture of prisoners, and the destruction of the country's infrastructure. The United States also left behind a system of governance based on ethnicity and sectarianism. According to the recent parliamentary election results, Nouri al-Maliki's bloc won 92 out of 328 seats -- which passes for a strong plurality in Iraq's fractious political system. He is nearly guaranteed a third term as a prime minister. This was the first election since U.S. troops left Iraq and the third election since the removal of Saddam Hussein. Terrorist attacks have continued in Iraq up to the recent elections. Over the last year, approximately 1,000 civilians have died each month from the violence, much of it generated by foreign terrorists coming from Syria through Turkey and led by al-Qaeda linked forces such as the Islamic State of Iraq and Syria (ISIS). Despite the violence, the election was relatively free. Still, the recent election results have not resolved any of the underlying conflicts in the country. After the elections of 2010, Dawa Party head Nouri al-Maliki's Shia-backed coalition brokered a deal with other groups to win a second term for al-Maliki as prime minister. The central government under al-Maliki continued to enjoy the support of the oil-rich eastern and southern regions, which are Shia bastions. But al-Maliki accuses the Sunni Gulf states and Saudi Arabia of funding terrorist organizations in Iraq. The Sunni provinces, chiefly Anbar province in the West and Nineveh in the Northwest, remain a source of discontent and a fertile ground for terrorism. ISIS challenges the central government's control of these regions and effectively holds the city of Fallujah. They have reached areas surrounding Baghdad and attacked one of its Shia universities. Al-Maliki's government has proven willing to fight terrorists with brutal force, if necessary. However, the terrorists retain support in Fallujah and the surrounding area because of the broader anti-government sentiment in the region. Since 1991, with the help from the United States, the Kurds have meanwhile maintained a semi-autonomous region in the North. The Kurds have a respectful and watchful relationship with Turkey in the North and Iran in the East. The Kurds' relationship with Iraq's central government is more contentious, as Erbil struggles to get more land and more oil under its control. The disputes even have an international dimension. The Kurds, for instance, have attempted to export oil directly to Turkey. But the government in Baghdad insists that the deals require central government approval, and Turkey would rather keep a good relationship with Baghdad. Despite the challenges of running a semi-autonomous government, the Kurdish region is thriving relative to the rest of Iraq. Al-Maliki has autocratic tendencies. He tends to label all of his opponents as terrorists. Instead of working with elected officials, he ignores the parliament and concentrates the levers of powers in his own hands. Corruption, graft, and favoritism have returned in force. Iraqis are leaving the country in droves, especially minorities such as Christians. The enemies of Iraq continue to hope that the country will plunge into a civil war and fragment into three regions -- Shia in the East and South, Sunni in the West and North, and the Kurds in the North. Such fragmentation is unlikely for Iraqis, who despite their infighting tend to identify with Iraq as a whole. If Iraq is divided, the Sunnis will be out of oil. The Kurds, because of opposition from Turkey and Iran, understand it is the wrong time in history to declare an independent country. (With their own large Kurdish minorities, neither Turkey nor Iran wants an independent Kurdish state on their borders.) And the Shia are Iraqis first and want to govern Iraq as whole. Iraqi political leaders from all the factions can resolve the country's problems if they place the interests of Iraq ahead of their personal, factional, and sectarian interests. This is a tall order. Al-Maliki has had his chance to lead Iraq. He has failed for many reasons, some of them beyond his control. Nevertheless, al-Maliki now has a chance to put together a new team at the helm. The primary challenge facing this new government is to resolve the political divide between Sunnis and Shia created and exacerbated by the occupiers. Governance must be shared with the elected officials in parliament. The new team must come to terms with the Kurds, and the Kurds must be reasonable in accommodating the historical burden of present-day Iraq. Finally, the new team must stamp out corruption and graft. Iraq must be given a respite to repair and rebuild the country for all of its citizens. The political leaders of Iraq must eradicate the post-occupation remnants of ethnic and sectarian animosity and control the bloody violence that is plunging the country into a new civil war. This could be Iraq's last chance. "...IMO, the major nemesis continues to be sectarianism, systemic corruption and the security debacle along with its associated violence and human tragedy..."
Three days of major jihadist attacks around Iraq, including on a university, have left dozens dead in a stark display of militant strength and the country's enormous security challenges. Militants assaulted the city of Samarra, battled security forces in Mosul, took hundreds of hostages at Anbar University in Ramadi and carried out numerous other attacks in Baghdad and elsewhere. Powerful jihadist group the Islamic State of Iraq and the Levant has been blamed for most of the latest attacks, and is believed to be responsible for much of the violence in the country. "Evidently, ISIL is in a very strong position," said John Drake, a London-based security analyst at AKE Group. "It is able to stand its ground in open fighting with the national security forces, which is major." And with even the United States having struggled to curb violence in the country, it will be even more challenging for Iraqi security forces, which have significant shortcomings in training and discipline. "Militancy in the centre of the country was a major headache for the strongest military force in the world, so it's no wonder that the Iraqi security forces are encountering such difficulties," Drake said. "They are facing a massive challenge." Kirk Sowell, the Amman-based publisher of the Inside Iraqi Politics newsletter, said the violence clearly shows that militants are "very strong". But the question is why "they have maintained this strength... why are the Iraqi security forces not more capable of dealing with this?" One issue is widespread arrest campaigns by security forces that Sowell said sweep up many people who are likely innocent, terming it a "completely ineffective security policy". He also said the high rate of turnover among senior officers is problematic, noting that there have been five different top commanders in restive Anbar province in roughly two years. "They keep recycling these generals... but there's no change in tactics, there's no evidence that they're learning," he said. The latest large-scale attacks began Thursday morning, when militants travelling in dozens of vehicles, some mounted with anti-aircraft guns, attacked the city of Samarra, north of Baghdad, and occupied multiple areas. They were only displaced after heavy house-to-house fighting and helicopter strikes, during which officials said 12 police and dozens of militants were killed. The following day, heavy fighting broke out between security forces and militants in multiple areas of the northern city of Mosul, one of the most dangerous areas of the country. The clashes and shelling, combined with other attacks in the surrounding Nineveh province, killed more than 100 people over two days. And on Saturday, militants infiltrated Anbar University in Ramadi, west of Baghdad, killed its guards and took hundreds of students and staff hostage. The attack prompted an assault by security forces that eventually freed the hostages but also led to an hours-long battle with militants. While militants have attacked government buildings and taken hostages before, universities are not their usual target. "The targeting of young civilians in violence is more emotive than attacks on the security forces," Drake said when asked about the university attack. And later on Saturday, seven bombs ripped through different areas of the Iraqi capital, killing at least 25 people. Iraq is plagued by myriad problems that contribute to the violence, from widespread anger among the country's Sunni Arab minority, long-running political paralysis, ineffective security forces and the bloody civil war in neighbouring Syria. None of these issues are likely to be resolved soon. Any Iraqi wondering why I am focusing my criticism on the govt... I expect the homicidal thugs in the insurgency to be thuggish. But the Iraqi govt, in order to defeat the insurgency, has to rise above thuggery, and its tolerance/reliance on Shia militias only fans the flames. If you know Arabic, watch the last part of this...Maliki using a nat'l address to warn against "questioning" the military. If you've read much history, how many disasters have befallen countries because leaders shielded their policies from criticism. Folks, this is starting to fall apart in Iraq. Tonight we have Iraqi police taking off their uniforms and walking away....This could escalate to full abandonment. The abandonment of vehicles and uniforms is dangerous as ISIL will gladly take them. Rafidayn says "tribal revolutionaries" have taken over not only provincial center but also the Army's operations command HQ in Mosul. Hundreds of gunmen thought to be members of Syria-based militant group take control of key portions of Iraqi city of Mosul, officials said. Militant gunmen freed up to 1,000 prisoners from prison in northern Iraqi city of Mosul, police officials said. Ninawa prov council saying there were advanced reports of ISIS gunmen moving into the area, preparing an offensive days ago, but.....the army did nothing to prepare. And just read that Maliki has removed Army 2nd Div Commander General Abd al-Muhsin al-Felhi. Events of the past few days are an indictment of the entire Iraqi political class. PM Maliki surely bears huge responsibility as he has had totally unfettered appointment control over military officers for eight years. But Ninawa Gov Uthil al-Nujayfi is among those who traffic in this nonsense that ISIS is an Iranian front and the nonsense that any real Sunni militants are just frustrated & need reconciliation. BREAKING: Iraq's prime minister asks parliament to declare a state of emergency over Mosul attack. "I announce General Mobilization and total readiness to all powers -- political, financial and popular -- to stop the terrorism and bring life to normal in the areas controlled by the terrorists in Mosul or any other city that they might be there. We will not allow for Nineveh and Mosul to be under the shadows of terror and terrorists. The cabinet prepared for all the needed authorizations, and all the financial needs, and all possible gatherings. It created a special unit, called the Crisis Unit, to follow up on the operations of gathering and preparing and arming and planning, and taking all needed steps. There will be a serious effort put by the security forces, and the military leaderships, firstly to evaluate the previous period of time, and to punish those who were reckless and those who did not rise to the challenge, and secondly, to benefit from the experience, so it would be avoided in the future." All Iraq's constitution says re state of emergency is that PM will be afforded "necessary powers"...zero detail is provide on what that means...@AhmeedAJ @Abufellah constitution is so badly drafted that it doesn't say...just says that PM will be granted "necessary powers"
Is it possible for Maliki to create a state of emergency so he can stay in office? A source in the National Alliance, he is no longer preoccupied with the formation of the government because he was engaged to study the formation of a "collective leadership" to manage the crisis of the current security, while calling for Deputy for the Sadrists, to expedite the convening of the first session of the parliament, amid calls to speed up the launch of political reforms, and changes in the elements of leadership , holds mitigate the effects of the current collapse. This comes at a time when the Federal Court announced on Monday that it has ratified all the winners of the House of Representatives in the last election, but delayed the ratification of the four MPs, including all of Salim al-Raad and Aldhlki and others. The Constitution requires the president to invite the new parliament to convene within 15 days of the ratification of the election results, with the possibility to extend this invitation for once. A senior source in the National Alliance for the "long", said the coalition parties are busy confronting the military stalemate, may lead to the postponement of negotiations on forming a new government until the restoration of security in the country, but the Liberal bloc parliamentary led by Muqtada al-Sadr, has called for speeding up a session first the House of Representatives and call for the election of a speaker and two deputies, and the formation of a government as soon as possible to meet the challenges facing the country. A source familiar with the National Alliance, said that "the coalition parties preoccupied with security implications and is not thinking of forming a new government until the restoration of the situation in the country." The source, who spoke on the "long" and asked not to be named, said that "the National Alliance in the process of forming a joint command in order to face the repercussions of security in Mosul and other areas," expected "the inability of the new parliament from holding its first session within the time limit prescribed by the constitution ". For his part, MP Awad al-Awadi, a member of the Liberal bloc, said that "the first meeting must be held within 15 days after the ratification of the members of the new deputies and managed by the oldest member," likely to be "MP Fuad Masum, is the interim president of the parliament, which would call for the election The choice of the speaker and his two deputies and the president of the republic. " "The first session requires a political agreement for the selection of the speaker and the president, and because of the circumstances of the country, and constitutional vacuum and the challenges facing the country, it should be no insistence by all the political blocs in order to hold the first session of the Iraqi parliament," and urged the Vice-President to "call for the convening of the first session and invite the political blocs to accelerate the formation of the government." Article 55 of the Iraqi Constitution, "The House of Representatives shall be elected at the first session its president, then a first deputy and second deputy, by an absolute majority of the Council members by direct secret ballot." With Article (70 / I) to "elect the House of Representatives from among the candidates President of the Republic, a majority of two-thirds of its members, secondly," If none of the candidates on the required majority, the rivalry between the two candidates with the highest votes, and declared president who gets majority of votes in the second ballot. "as Article (72 / b) that" continues the president to exercise his duties until after the elections of the new House of Representatives and the meeting, that the election of a new president within thirty days from the date of the first convening of the Council. " In the same context, says MP Vian Dakhil, a member of the Kurdistan Alliance, said that "the serious situation experienced by the country currently does not refer to the first session of the Iraqi parliament over a short period," indicating that "no agreement politically at the present time a lot of important topics and vitality" . Ruled out an intruder in an interview for the "long" be "there is an agreement on the formation of the new government and the selection of the three presidencies, because the quotas are master of the situation at the present time," pointing out that "the President of the Parliament should be determined within 15 days of approval of the final results of the members of the Board House of Representatives, according to the Federal Court and the Parliament is dissolved, in the absence of a vote on the parliament speaker and his two deputies. " She added that "the Federal Court said the subject of her open meeting and there is no open session, as happened in the previous parliamentary session during which the selection of the three presidencies." She continued by saying, "presides over the first session of the parliament and the oldest member during which election of the Speaker and his deputies," calling for political blocs to "leaving aside political differences and work to convene a session of the new parliament." Later in the Park Prime Minister Nuri al-Maliki "to the Iraqi people and the new deputies" Declaration of the Federal Court ratified the results of the recent parliamentary elections. Maliki said, through a statement seen (range) a copy of it, "We have become front complete the rest of the steps of the democratic process and the formation of the government and launch a new phase of the political process which we hope will be characterized by understanding and national unity and concerted efforts to counter terrorism, which is the enemy of all Iraqis and even the whole of humanity" . The seal-Maliki said: "We hope that further enhances national efforts now to win the battle with terrorism and Iraq to save, protect and averting evil enemies." ......and senator Lindsey Graham also says..."Iraq matters"
As the Obama administration is about to send military advisers to assist Iraq’s government there are growing reports that Washington wants Prime Minister Nouri al-Maliki to be replaced. The argument is that the premier is a divisive figure and that by getting rid of him the country’s politics can move forward, which will in turn help counter the insurgency. Finding a new prime minister could definitely improve the atmosphere in Baghdad in the short term, but it is no panacea for the deep structural problems facing Iraq. President Barak Obama has called for a more inclusive government in Iraq as a caveat of receiving American military aid. The New York Times reported that some Iraqi politicians are taking this to mean that Washington is opposed to Prime Minister Nouri al-Maliki returning for a third term. The Guardian wrote that even Iran might be tiring of Maliki’s rule, although that is contradicted by other stories. The argument is that the premier has caused so much distrust within the country’s establishment that he must go if Iraq is to create a new government that includes the three major ethnosectarian groups the Shiites, the Sunnis, and the Kurds. Together this new ruling coalition is supposed to reach out to Sunnis so that they will not give at least passive support to the insurgency and help unite the country overall in the face of the growing violence. A new premier could help Iraq with some of its short-term problems. For instance a new premier from say the Islamic Supreme Council of Iraqi (ISCI) would have a much better relationship with the Kurds who have lost complete trust in Maliki. ISCI and the ruling Kurdish parties have had a good relationship dating back to the 1980s when both were supported by Iran and fought on Tehran’s side in the Iran-Iraq War. Those lists could work together and come to an oil export agreement that would actually be followed through with rather than the last two where Maliki refused to pay the Kurdistan Regional Government (KRG) all the money that it was owed. There also would not such heated rhetoric between Baghdad and Irbil the capital of Kurdistan. Parties like Speaker Osama Nujafi’s Mutahidun might be more willing to join a coalition as well since it currently opposes Maliki returning to office. A new national unity government could therefore be put together based upon the shared animosity towards the premier and make some deals between the lists. Those short-term gains however would not overcome Iraq’s deep-seated institutional problems. For instance, any new coalition would still be based upon ethnosectarian quotas where ministers and other officials are named not by their competence, but rather by their party being Sunni, Shiite, or Kurdish. The endemic corruption would not end as this has become a means of governance where every winning party gets to steal part of the government pie to enrich itself and maintain its patronage networks. The economy would still be the most oil dependent in the world, and the parliament would be no closer to passing an oil law as the Sadrists and ISCI both want central control over the industry, while the Kurds want autonomy. Other reforms that have been called on for years such as ending deBaathification are unlikely to come about since parties like the Sadrists are ardent supporters of it. The competence of the Iraqi Security Forces would not suddenly improve, and neither would its counter productive tactics either. The new premier would likely follow the same types of coup proofing tactics that Maliki and every other leader in the Middle East has done, which is to put loyalists in top positions and maintain Maliki's separate chain of command over the army and police. Finally, every government since 2005 has been a national unity one. The simple inclusion of parties from each group did not stop the insurgency back then and will not deter it now. The Islamic State of Iraq and the Levant (ISIS), the Baathist Naqshibandi, and others are not interested in being included the government, but rather want to overthrow it. Sunni votes were spread across several different parties as well who do not agree with each other showing that at least those who voted would not suddenly unite either, because there is no agreement upon which party or individual should be the leader. Without solving these long-term issues Iraq’s future would still appear dim. The talk of replacing Maliki is a popular one, but it provides no real solutions to Iraq’s deep seated problems and divisions. The greater cooperation amongst the major lists that might emerge in the aftermath of Maliki not be re-elected premier would likely fade with time, and all the internal political divisions over centralism versus federalism, the oil industry, etc. would re-emerge. Not only that, but the appearance of a new united front amongst the elite is not going to suddenly lead to a Sunni consensus to try politics again or more importantly end the insurgency. Therefore any short-term gains from Maliki being replaced will not pan out over time leaving Iraq still a very divided and violent country. Iraq's most-revered Shiite cleric called on the country's political blocs to agree on a prime minister in the next four days, putting pressure on a government that is struggling to address the growing security crisis. The call Friday by Grand Ayatollah Ali al-Sistani came as Human Rights Watch said that the Islamic State of Iraq and Syria, the Sunni extremist group that now control large parts of Iraq, likely executed at least 160 unarmed men when it took the city of Tikrit. "Tuesday's session will be the first since an election in April, and comes as parties jostle to form the largest coalition and therefore the right to appoint the prime minister. After parliamentary elections four years ago, government formation took ten months. International leaders have joined the religious establishment in urging haste this time around, as Sunni militants take more territory across the country." NPR's Larry Kaplow profiled Sistani earlier this week, and he noted that Sistani "stays out of the limelight, rarely meets with Westerners and doesn't do interviews. But he has generally been a calming influence and often helpful to U.S. efforts in Iraq." Last week, Sistani called for an Iraq government that "avoid past mistakes and open new horizons toward a better future for all Iraqis." That statement was seen as a tacit criticism of the government of Shiite Prime Minister Nouri al-Maliki, who has been accused of marginalizing the country's minority Sunnis. "A senior Iranian general who met with Shiite politicians in Iraq during a 10-day visit this month returned home with a list of potential prime minister candidates for Iran's leadership to consider, several senior Iraqi Shiite politicians who have knowledge of the general's meetings told The Associated Press on Thursday. The general, Ghasem Soleimani, is expected to return within days to inform Iraqi politicians of Tehran's favorite, they said, speaking on condition of anonymity to discuss the internal deliberations." The political maneuvering came as fighting between Iraqi forces and ISIS continued. The AP reports four helicopters with Iraqi commandos landed at a soccer pitch inside a university campus in Tikrit late Thursday and clashed with militants; also, 200 troops arrived at the Beiji refinery, Iraq's largest, which has been taken over by militants. Earlier this month, ISIS militants captured Tikrit as well as Mosul, one of Iraq's largest cities, with relative ease. But in the wake of their gains, they have left behind casualties. "Those killed may have been air force recruits, working on a local air base. But when the fighters from the extremist group known as ISIS captured them, they were wearing civilian clothes and unarmed. Footage posted by ISIS and analyzed by Human Rights Watch shows the masked extremists lining men up on the edge of a trench outside the town of Tikrit, and shooting them with automatic weapons. ISIS took Tikrit as they swept through northern and western Iraq almost two weeks ago. Residents in the Sunni-dominated area have long complained of ill-treatment by the Shiite-led security forces. But they say they are fearful, too, of the brutality of ISIS." (Note to readers: NPR is calling this group ISIS. Other organizations, including The Associated Press, are calling it ISIL, for the Islamic State for Iraq and the Levant. Reuters news agency reported that top Shia, Sunni and Kurdish lawmakers scrambled to agree on cabinet nominations before the parliament meeting on Tuesday, to try to prevent the rebel advance threatening Iraq's future as a unitary state. In an audio recording distributed online on Sunday, the ISIL declared its chief Abu Bakr al-Baghdadi as "the caliph" and "leader for Muslims everywhere". Prime Minister al-Maliki is under instense pressure as Sunni fighters led by the ISIL consolidate their grip on the north and the west of the country. "How appropriate, Iraqi parliament starts a new electoral term by failing quorum. They made it at first then 30 min later some left, quorum lost. At this moment, Jaafari is arguing for a one-week delay, meet again. Can't meet just to swear in but can't do that w/o quorum. Some absent MPs communicated that they wanted to meet tomorrow to swear in. Did they want to start getting those salaries now? Temp Speaker Mahdi al-Hafith agreed with the one-week proposal. So next Tuesday they will meet and maybe postpone again. Jaafari, who couldn't stop speaking, said, basically, "Maybe postpone three or four weeks, to after Ramadan, there is no problem." ..the Shia bloc hasn't agreed on a replacement for Maliki, so why bother follow the constitution and elect a speaker. What's the point. Iraqi parliament procedure is such that a quorum is broken whenever they drop below. This is how legislation is blocked." "As I've said before Iraqi politicians are not letting a war get in the way of their political disputes..."
Iraqi parliament still doing the two-step, while we "just step back..."
Iraq's parliament postponed at least another month amid disagreements over who will lead, state TV says. election in April and had planned to meet again this Tuesday. The U.S should be ashamed to let this nonsense continue. What are 15,000 Americans in the embassy doing? BAGHDAD -Head of the Age of the House of Representatives Mehdi al-Hafez said on Monday that the decision to postpone the parliamentary session was taken on the basis of the agreement of all political blocs. He said in a press statement that all political blocs are responsible for the decision to postpone the hearing until after the holiday,” noting that he would not take the decision alone, but was based on the agreement of all political blocs. Hafiz pointed to the existence of semi- agreement to move forward the Parliamentary session next week. He continued that they will issue a statement tomorrow about the Parliamentary session scheduled to be moved forward to next Sunday. The new head of the House of Representatives lifted the first session of the Council, which took place last Tuesday to next Tuesday in order to give more time to consult the political blocs to nominate the candidates for the three presidencies. All of these secret meetings are set up to drive us investors......crazy. I talked with my friend and he said 2015, but 2017 is a more probability. I almost hung up on him LOL LOL.....but if you will remember skyninja has always said 2017. Iraqi Sunni MP Nujaifi: "We have presented our candidate 4 speaker and done what we should do. We hold the other blocs responsible for the delay." "Failure, blame is on temp speaker, Mahdi al-Hafidh. No MP suggested a delay. He insisted on it. He closed the session w/out a vote...All in all, these Iraqi MPs seem to lack any appreciation of how bad #Iraqi problems are. They are not just incompetent, they are deranged." Congratulations to Salim Jabouri, just confirmed overwhelmingly by #Iraq's parliament as its next speaker. We look forward to working w/him. Well congratulations to members of the Iraqi parliament for finally doing their job and electing a speaker and two deputies. I presume most following me already know Iraq's new parl't leadership are Speaker Salim al-Jiburi, 1st Deputy Hayder al-Abbadi & 2nd Deputy Aram Muhammad Ali. They are from the Islamic Party, the SLC/Dawa Party and Gorran, respectively. A few comments on today's events... the election of Jiburi and a Gorran candidate are not a surprise. Former speaker Osama al-Nujayfi's election strategy of going extreme and tacitly allying with the insurgency made him unelectable to Shia. And the Kurdish duopoly will get the higher ranked posts, so it is appropriate for Gorran to get deputy speaker. The surprise of the day was Abbadi as 1st deputy speaker. In fact this is a really major move. ISCI's Humam al-Hamudi seemed to have it. The first implication is that while Maliki's 3rd term was already on life support from the SLC, he is Dawa. And that means it is hard to see Tariq Najm or Ali al-Adib being PM as well (not that Adib had much chance). Baqir al-Zubaydi seems likely to take a post as deputy PM for security affairs, so we are back to 2006 in more ways than one. This makes Jaafari, Shahristani and Falih al-Fayyad the leading PM candidates. Shah has been talking like a candidate lately for sure. Jaafari and Fayyad are of course from the same party, & Jaaf has the baggage. The hate for him has receded over the past 8 years, but still there is also a possibility of a "wild card." But Maliki was not truly pulled from obscurity in 2006 as some claim, he was Dawa's No. 3. So I suggest we are down to Shahristani, Fayyad, & Candidate X. I have a hard time seeing Shah staying on as deputy to a backbencher. The problem is that Shahristani has more seats in the SLC than anyone. Realize lots of people can't stand the thought of him in that office, but with Dawa stepping aside, it is basically Shahristani and Badr's Hadi al-Ameri who will drive the SLC. Maliki will not be able to hold on as has Syria's Assad. His "base" is paper thin, despite electoral results. Maliki tried to shore up his "base" yesterday by organizing rallies in favor of a third term. Almost no one showed up. Maliki's speech today is likely an act of desperation and another strategy to delay the end of his tenure. "I suggest locking up Iraqi politicians in an abandoned building without food & water & electricity, like the IDPs, until they form a new govt..."
"After years of crisis under Maliki, the Shia parties ended up nominating yet another Dawa Party PM candidate. There has been talk of discontent within Dawa for a while. Abbadi is long-time Dawa activist and leader. We know a lot. Standard Dawa resume...and yes, a bit surprising, Abadi has often been a Maliki surrogate." Maliki has his surrogates out in the media at this point still pushing his line. Maliki not "forced out as PM" as of yet. He is not giving up. Maliki may be going into full "Hitler in the Bunker" mode, just let the country burn down, who cares...thus the crazy Hitler reference, directing non-existent armies. Maliki commands a non-existent coalition." It looks as though politician, Haider al-Abadi, will be Iraq’s next Prime Minister. If, or when, al-Abadi manages to form a new government there are three serious challenges waiting. On Monday, August 11, 2014, the newly chosen Iraqi President, Fouad Massoum, asked Haider al-Abadi to form a new government. Al-Abadi, a Shiite Muslim politician and senior member of the Dawa party – the same party to which Iraqi Prime Minister Nouri al-Maliki belongs – had previously been elected as Deputy Speaker of Parliament. Up until now there have been no leaks about how the deal to nominate al-Abadi was done. It is more than likely that the State of Law coalition, which was originally formed by al-Maliki, is now seeing internal divisions. Its members would be divided between those who support al-Abadi and those who support al-Maliki. Some say that there was an internal coup at the last minute, with former Prime Minister, Ibrahim al-Jaafari, who has good relations with senior members of al-Maliki’s own party, convincing these politicians to support al-Abadi. Another theory holds that US diplomats convinced the Iranians – strong supporters of al-Maliki up until recently – that if al-Maliki stayed in power then the Sunni Muslim extremist group known as the Islamic State would breach Baghdad’s defences. The same theory says that as a result, in turn, Iran convinced religious authorities to support al-Abadi and abandon al-Maliki. Supporters of this scenario say that al-Jaafari was also working behind the scenes in this play. Only a few hours after al-Abadi’s nomination became official, there was literally an outpouring of support for him. This seemed to mostly reflect the huge amount of antipathy toward al-Maliki as a person rather than anything to do with his sect; al-Abadi is also a Shiite Muslim, as well as being a member of the same political party. Iran, the US and the European Union all welcomed al-Abadi’s nomination. The King of Saudi Arabia also congratulated al-Abadi, saying that he hoped this would herald “Iraq’s return to the Arab and Islamic world”. A variety of noteworthy congratulations were made by Shiite Muslim political actors. The extremist Shiite militia known as the League of Righteous, which is supported by Iran and which also has a political wing now, said that directives by religious authorities should be respected and that there should be no military interference in the political process. The leader of the Sadrist movement, a huge Shiite Muslim political and military group, also seemed pleased. “The nomination of al-Abadi is the base from which we will reach safety,” cleric Muqtada al-Sadr noted. Even the Union of National Forces, an alliance of Sunni Muslim political parties, welcomed the move and said al-Abadi’s nomination “gave hope for change in the country”. The group said they would support al-Abadi and that they would begin negotiations with the Shiite Muslim political parties to form the new government. In fact, it may well be that no other Prime Minister in Iraq has ever received this kind of welcome. And given the number of serious problems that await al-Abadi, he may well need all the support he can get. 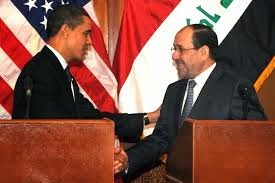 The first problem he faces is the fact that al-Maliki has yet to cede power. Al-Maliki continues to talk about conspiracies against him, to say that the Federal Supreme Court has not done its job properly and that Iraq’s President Massoum has violated the Constitution. Additionally al-Maliki’s followers have been demonstrating in the centre of Baghdad since Monday, calling for al-Maliki to stay in the job. However there are not more than several hundred of them. So the first question for al-Abadi is whether al-Maliki could block his chances to be Prime Minister? The two have been in the same political party for more than 30 years even though al-Abadi has been living in Baghdad for years and al-Maliki comes from Karbala. And should this problem be solved, what are the greatest challenges al-Abadi faces over the next four years? The first, and most obvious challenge, that al-Abadi’s new government will face is the threat posed by the Sunni Muslim extremists from the group formerly known as the Islamic State in Iraq and Syria, now simply known as the Islamic State, or IS. They are now present in many areas in Iraq where there is a Sunni Muslim majority – they control some places, like Mosul, by themselves; in others they are allied with Sunni Muslim militias and fighters who were opposed to al-Maliki’s government. The Iraqi army, many of whose leaders are loyal to al-Maliki, is not making much progress in liberating these areas. So the new Prime Minister will need to convince his US allies that they should stand by his side. He also needs to evaluate the efficacy of the Iraqi army – after the armed forces fled the northern city of Mosul, abandoning their weapons and equipment to the approaching fighters from the IS group, the Iraqi army was roundly criticized. Many said that during al-Maliki’s time it had been a way of providing jobs and patronage to soldiers and leaders who were unskilled and unsuited for the job. Another security problem involves the Shiite Muslim militias who have been deployed both as security in Iraq’s Shiite-majority centres as well as on the frontlines in the battle against Sunni Muslim extremists. In Baghdad there are at least five militias on the ground and they represent a serious challenge to the new government’s authority. Most prominent among them is the more extremist League of Righteous militia, which has already gained a reputation for terrorizing the people of Baghdad and committing sectarian-motivated crimes in other areas, such as Anbar, Tikrit and in the northern and southern parts of Baghdad. Everyone knows that al-Maliki plays a personal role with these militias, having provided them with weapons, money and power. Although as has also been pointed out – and particularly with regard to the League of Righteous – these militias are also influenced by Iran, who also provide them with funds and arms; and for the time being Iran is not on al-Maliki’s side. The new government will also need to navigate a cautious path toward reconciling the various sectors of Parliament who have been antagonised by al-Maliki over the past few years. The Iraqi Kurdish want their share of the national budget – al-Maliki suspended payments to them over oil disputes. The Iraqi Kurdish also want to negotiate the so-called disputed territories – that is, areas they say belong to them but which Baghdad also claims. The tricky part here is that, with the withdrawal of the Iraqi army and the attempted entry of the Islamic State group into some of these areas, the Iraqi Kurdish now control some of the places they always wanted, such as Kirkuk. It will be difficult to find a suitable solution to this as the Iraqi Kurdish are highly unlikely to want to give those areas back. Most Sunni Muslims and Sunni Muslim-majority areas were alienated by al-Maliki over the eight years he was in power. He had threatened and imprisoned a number of leading Sunni Muslim politicians and some, such as former Anbar MP, Ahmad al-Alwani, are still in prison. The fact that Iraq’s Sunni Muslims felt disenfranchised and oppressed by al-Maliki provided an opportunity that Sunni Muslim extremists were able to exploit. For example, when the IS group first took control of Mosul they were greeted as heroes for removing the mostly Shiite Muslim Iraqi army. The IS group were also supported by other Sunni Muslim militia groups, such as the Naqshbandi army, the military wing of Sadam Hussein’s outlawed Baath party. NIQASH has learned that the leaders of some of those Sunni Muslim factions have already sent letters and messages to Shiite Muslim officials, offering them a chance for real dialogue after al-Maliki has been removed. But the question is: Will al-Abadi and his new government support this dialogue? Because obviously these armed factions have their own conditions. They do not want the Iraqi army – which was more and more composed only of Shiite Muslims during al-Maliki’s regime – to be able to return to the Sunni-majority areas. In return, the Sunni Muslim fighters say they will expel the far more vicious, brutal and uncompromising IS group from Iraq. There are also ongoing efforts to form regular troops in Sunni-majority centres that would act with independence, similar to that of the Iraqi Kurdish forces. Of all the challenges, any new Iraqi government will have to face, possibly the most frightening and complex is economic. The country has seen budget deficits rise by as much as a third, last year’s budget has not been approved and this year’s budget has not yet been tabled. The Development Fund is supposed to bridge any budget deficits – but as the deficit gets bigger and the bridging funds get smaller, Iraq may well be facing a serious economic problem. Additionally, since 2010, al-Maliki has continually rejected any requests to submit annual accounts to Parliament. The excuse was that government ministries had not sufficiently developed their accounting departments or that there were technical issues. However for a long time it has been thought that these excuses were really just a cover for major corruption. Oh gosh!.....Look at all there is to do! !......Where do I start? ?.......Wow, when will I sleep?.......Why did I take this job??? My compromise plan is better!! !